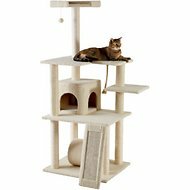 Watch your cat jump, stretch, climb, play and relax on FurHaven’s Tiger Tough Double Decker Cat Tree! 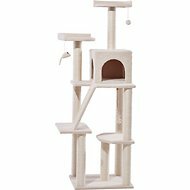 This tall cat tree is over 5 feet tall and has multiple levels to keep your companion busy and entertained. It’s designed with two separate enclosed cat condos, a Cat-IQ busy box, a dangling mouse toy, posts made of sisal for plenty of scratching, a dangling ball and a springy-wand ball. 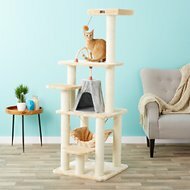 The multi-level tower has fabric-covered shelves that are soft to the touch and cat houses of various shapes and sizes. The fabric-covered ladder gives your sidekick easy access from the bottom cat house to the second. And you can easily keep your cat’s new playground in tip-top condition by spot-washing it with a damp cloth and a quick vacuuming when needed. 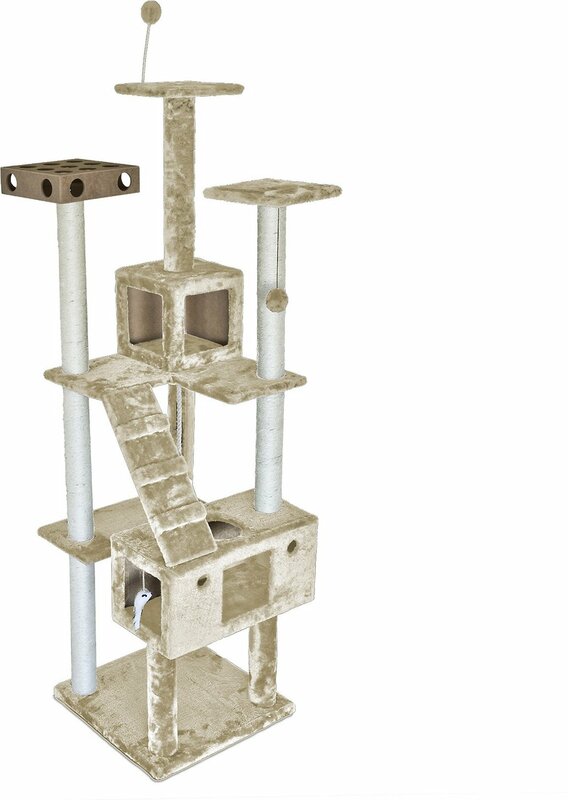 Features two separate enclosed cat condos that’s purr-fect for multi-cat households. Some of the posts are covered with sisal for all of your feline’s scratching needs. Designed with a Cat-IQ busy box to help keep your paw-tner entertained and as sharp as a tack. Comes with multiple enticing toys—mouse, dangling ball and springy-wand ball cat toy. Easy to assemble and only requires the occasional spot-clean with a damp cloth and vacuuming as needed. I really wanted to like this, but unfortunately it's rarely used by my cats. Even at 7 months old, my cat was too big to fit in either cubby, and even after sprinkling with catnip and putting treats in them, she refuses to go in. The perches are too small to lay on as well, so the most she can do is sit on it to look out the window, but even then she prefers the sill instead of the tree. They do like the busy box but are able to knock the toys out in a few seconds. The little mouse was intriguing for a bit but was pulled off by her the night I set it up. Overall, spend a little more to get one that'll fit a normal sized cat. This could be great for a kitten foster though. I got this to replace my older Armakat tree. My girls love the old tree. This tree's landings and houses are so small. I have a special needs cat and she can't use it. I already put it together and hoped for the best, but I am going to have to do something about the perches and accessibility. I paid a lot for this, and I feel like I can't return it now, so I'm hoping to help another avoid. It went together well and is impressive but the platforms and boxes are too small for my cats. They are normal sized house cats. They still climb it, but mostly use it as a bridge to the bookcases. It is a little unsteady as well. They seem to like the rattle toys. They pulled the balls out of the "busy box" in a matter of minutes and chased them around the living room. I also have a Frisco 78-inch cat tree, which they prefer. Such a fun cat tree! My cats just love this cat tree! It was easy to set up. It's a little obstacle course for cats with lots of fun toys. The balls it came with for the little box with the holes were a little small and kept falling out so we put some that are a little bigger in it and they work just fine. Definitely recommend this cat tree. 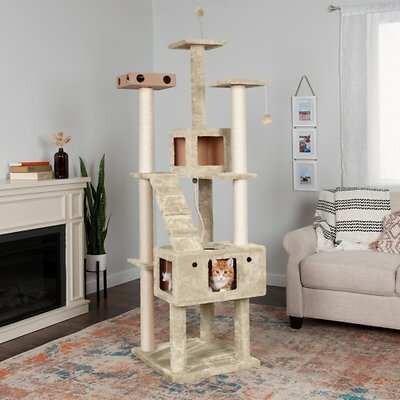 We have tall ceilings without much floor space, and this cat tree is just what we were looking for! It's nice and tall with a small footprint (though overall it is a smidge wider than the description). The construction is satisfactorily sturdy; it has a bit of a sway when our cat jumps up to the higher levels, but nothing in danger of tipping over. And most importantly, our cat loves it! Great Purchase - easy to assemble! We bought this for our 9 month old kitten. She loves it. She is loving exploring all the spaces and she really enjoys the height. The two older cats even enjoy this cat tree. One slept in one of the boxes. So far it has been great and we all love to watch them climb and play. I like the multiple levels of this cat tree but the the toys, not so much. My daughter's cat has removed the skin from the mouse and the hanging puff already and this has only been setup a week so far. Other than that, it's well made and the cat is having fun climbing all over it. The tree is nice and our 2 cats enjoy it. It is sturdy and even with both playing on it, it remains stable. The only thing kind of negative is the directions to assemble make it a little difficult to see which screw to use.